Easy to see and easy to pick. Easy to see and so very easy to pick, the gorgeous beans turn green after cooking. Beautiful in a basket and tasty on the plate. Bean, Purple Queen is rated 4.3 out of 5 by 10. Rated 5 out of 5 by MrsPenguin from So far, so good I threw a bunch of these seeds in the garden, haphazardly, as it was a little early in the season. Very quick germination rate, and have really taken over the garden. These beans are labeled as bush beans, but they do vine somewhat- I set up two trellis' in the places that I planted them, and about have of them have done some climbing. Beans are starting to appear, looking forward to the first harvest. From the abundance of flowers (beautiful purple! ), I forsee a great year for these beans! Advise for those who want to plant these- leave some extra space for them to spread. Might also be fun hanging in baskets. Rated 5 out of 5 by Adalaide from I grew some from starts and planted some straight in the garden. All grew wonderfully and produced well. Although none of the plants got particularly big, all did a great job giving me lots of beans. They were easy to spot on the vines and easy to pick. It never stopped being wonderfully magical watching them turn green when I cooked them, I'm sure it would be great for anyone with kids. They're delicious which is most important, and make a wonderful fried garlic and bean dish. Rated 5 out of 5 by Butternut from Love these beans! These beans keep producing, even without irrigation. 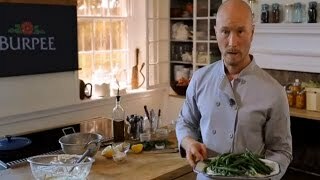 I think they are less tender than other green beans, but they roast in the oven beautifully. Rated 1 out of 5 by weeder from In what is normally a very productive garden, only one plant grew from 20 seeds. 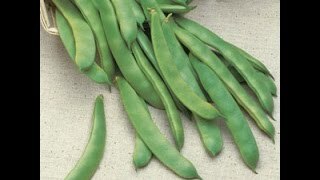 Rated 5 out of 5 by Kendra from Love these beans These were very easy to grow. We'd done these beans in our garden when I was growing up, and this was the first year I did them in the garden with my son. He loved them. They taste great fresh or cooked. They grow well, but give them some room to bush out, or close to a fence to help them with support. We started them from seeds and didn't get them out to seed until the first weekend of June. They still grew fast enough to eat during july. Rated 2 out of 5 by crazytxmom from A dud bean? I have planted several other varieties of bean (Tendergreen Improved, Italian Rose, Contender, Royal Burgundy, and Purple Queen) in my square foot garden, and they have all flourished... except my Purple Queen. All the other seeds have had a nearly 100% germination rate but out of the 9 Purple Queen seeds I planted, only 2 germinated! I planted these back on March 21st and other beans I planted at the same time are flowering, but these ones (the only 2 that sprouted of the 9 seeds) are half the size of the other bean plants, including my Royal Burgundy, which these are supposedly a strain of). I've had success with all the other seeds I have ordered from Burpee, but these ones just aren't growing! Rated 5 out of 5 by Mermie from Quite a beauty! These beans just keep coming. We planted a 6 oz. package very late in the season, but it didn't make any difference, up they came and are still coming on strong. When they first started producing I was picking 5-7 quarts every 3 days, then it went to 5-7 quarts every other day, late in the season they tapered down to 3 quarts once a week. Needless to say I've given quite a few bags away, and people just love the novelty of the purple color. I wish they stayed purple once they've been cooked, but they turn green - too bad. We've let the patch go to peelers, but the bushes are loaded, so it looks like I'll be making some kettle beans come November, which is just fine by me. Rated 5 out of 5 by CAGardener from Great Bean Last year was my first time with these beans, and they are fantastic. Great production and the beans kept coming well into August. The color also was a big hit with my neighbors, as they had never seen purple beans before. My only complaint is that they seem to rot in the ground more than the regular green beans do under similar conditions. All-in-all, though, well worth planting.